A magical journey behind the scenes at smash hit musical, Wicked. Visit the exclusive "Behind the Emerald Curtain" Museum, including an an intimate look at the Tony Award-winning sets and costumes, as well as some of the actual props and wigs from the show. The ultimate insider experience! 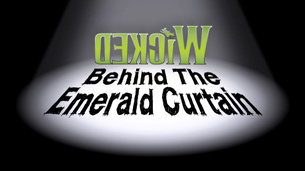 An intimate trip beyond what you see onstage, Behind the Emerald Curtain is an informative must for devoted Wicked fans. A rare opportunity to see Tony winning costumes and functioning pieces of the current Broadway production up close, the tour is also an up-close-and-personal primer in what life on Broadway is really like. Tours group sizes are kept modest, allowing for personal interaction with the hosts and other Oz enthusiasts. The tour is geared toward families of all sizes, and the content is appropriate for all ages. However, given the amount of show history presented and the in-depth Q and A that goes on, you may want to leave very young viewers with short attention spans at home—or be prepared to take them on a lap around the Gershwin Theater’s expansive lobby if they get restless.